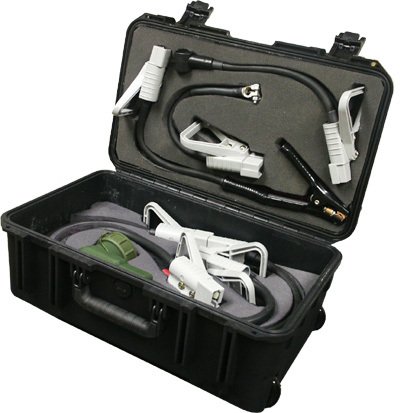 The Medusa Tactical Briefcase features connectors with quick connect/disconnect. This allows for quick configuration, setup and eventual tear down. This time savings can be important in tactical operations. Both the connectors and the cables are configured for specific current carrying limits. Our cables are classified as MTW (machine tool wire) which is composed of numerous fine strands allowing the cable can be easily manipulated. The included connectors are rated at 350 amps, and connected to a 2/0 cable which has a current rating of 300-330 amps in open air. 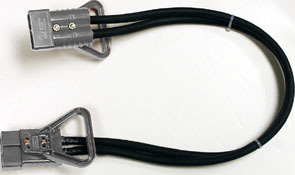 These cable/connector assemblies are limited to the cable’s limit or 330 amps. Power Connectors are all equipped with Quick Disconnect allowing for a multitude of possible combinations!